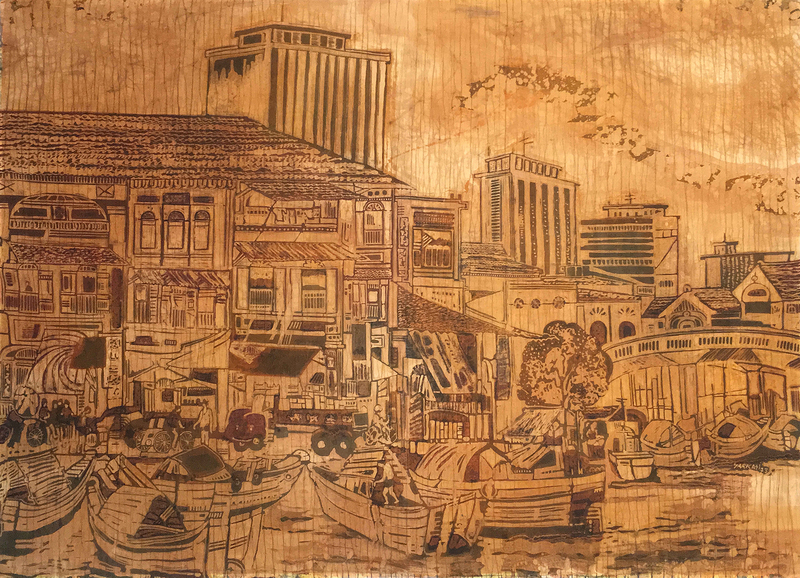 Sarkasi bin Said, who goes by the artist name Tzee, is an internationally renowned Singaporean batik painter. The artist is noted for his unconventional use of a wax-resisting technique for batik painting, his bold use of colours and his frequent depictions of nature. Sarkasi’s exposure to batik art came during his formative years and was a result of helping his grandmother who sold batik cloth as an extra form of income. However, he began to develop a serious interest in the art form after he saw an Italian artist’s exhibition in a gallery in Singapore in the 1960’s. He noticed that the foreign artist was using a technique that was a traditional art form in the region. As a Javanese, Sarkasi felt that it was important that he should return to his cultural roots, and focus on batik art because of its significance in Malay culture. He was inspired by the wax-resisting or wax-dyeing batik painting technique instead of both watercolours and oil for his paintings.